Facebook Video Marketing: Increase Your Reach, Results, & Revenue with VOD & Live Broadcasts! Facebook video is a powerful tool to generate leads and sales—but most businesses are struggling to integrate, optimize, and monetize video in their content and social media efforts. And while so many marketers are looking to step up their game on video and social media, they just don't know how to get started. 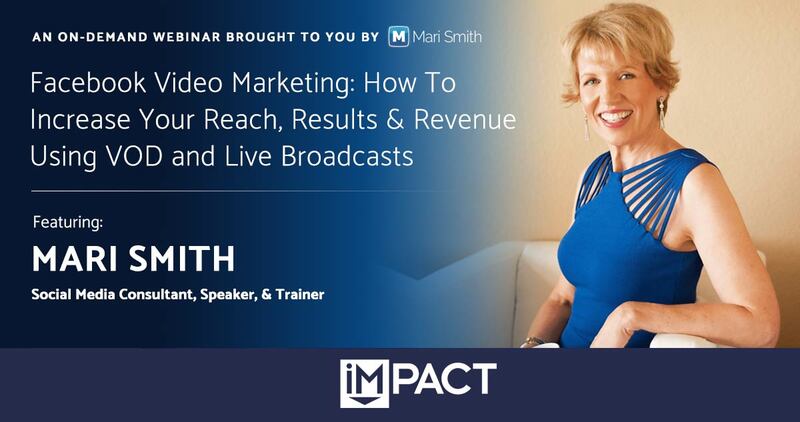 In this on-demand webinar, premier Facebook marketing expert Mari Smith shows you how to turn likes and views into dollars and shares her proven process to leverage video on demand and live broadcasts to amplify reach, increase qualified leads, and leap-frog the competition. She is a recognized Facebook Partner; Facebook headhunted and hired Mari to lead the Boost Your Business series of live events across the US. Mari is an in-demand speaker and travels the world to keynote and train at major events. Her digital marketing agency provides professional speaking, training and consulting services on Facebook and Instagram marketing best practices for Fortune 500 companies, brands, SMBs and direct sales organizations. Mari is also an expert webinar and live video broadcast host, and she serves as Brand Ambassador for numerous leading global companies.